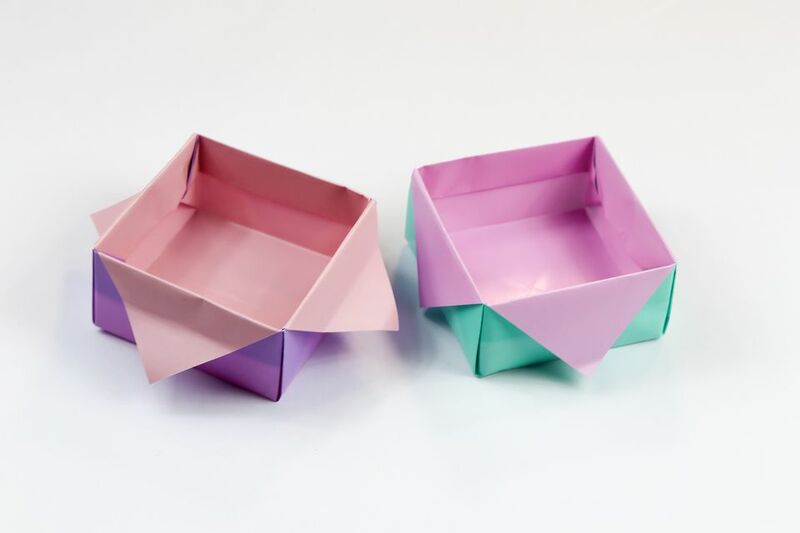 Fold a pretty variation of the traditional origami masu box. This one has the flaps on the outside, which makes it look like a star. This is an intermediate level origami, if you have folded the original origami masu box, you should have no trouble with this one. You'll need one sheet of square paper for this box, it's nice if you have​ the paper that has a different color or pattern on each side, such as this type of paper. If you don't have any fancy origami paper, you can find different kinds of paper that you can use that you have around the house. 1. Start by folding the paper in half, top to bottom and left to right so that you have central point. 2. Now fold one of the corners to the central point. 3. Continue folding the corners to the central point and then rotate the paper. 4. Fold the top and the bottom edge to the central point. 5. Unfold the top and bottom. 6. Now fold the left and the right edges to the central point. 7. Unfold them and this is what you should have. 8. Flip the paper over to the other side. 9. Fold the paper diagonally - fold the bottom right corner up to the top left corner, and then fold the bottom left corner up to the top right corner. You can avoid creasing the square in the middle, for a neater result. 10. Flip the paper over to the other side. 11. Unfold the top flap back up, and align the crease with the top edge of the layer behind. 12. Now fold the other flaps in the same way. 13. Fold the flaps behind. 14. This what you should have. 15. Unfold the left and right flaps. 16. Fold the top and bottom flaps to the center. 17. Now you can assemble the box by folding the right side up and opening the top and bottom flaps upwards. 18. Straighten out the creases. 19. You can see there are little pockets on either side. 20. Fold the right side over and into the little pockets. It might take a few attempts to get both of the flaps inside the pockets, but if you curve the corners in at the same time, they will pop in. 21. Flatten out the folds. 22. Now do the same with the left side of the box. 23. Here you can see both flaps going into the pockets. And now it's finished. You can leave the flaps as they are, stick them down or pull them up to produce different looks. Check out the youtube channel called Paper Kawaii, if you like origami. Get Organized with a Masu Box Divider! How to make a Layered Origami Bow Decoration!